We’ve made it to the end of August and have made a couple of really huge strides this month. First of all we’re proud to announce that the Rogue Wizards Steam Store Page is now online. Players can now follow and add the game to their Steam wishlists as well as talk with each other in the community hub. Getting the Steam page to this state is actually a huge step towards starting the Alpha program later this year because we’ll be running the alpha and beta through Steam, and now we’re completely ready with all the necessary distribution tech to get the game into your hands for testing and feedback. 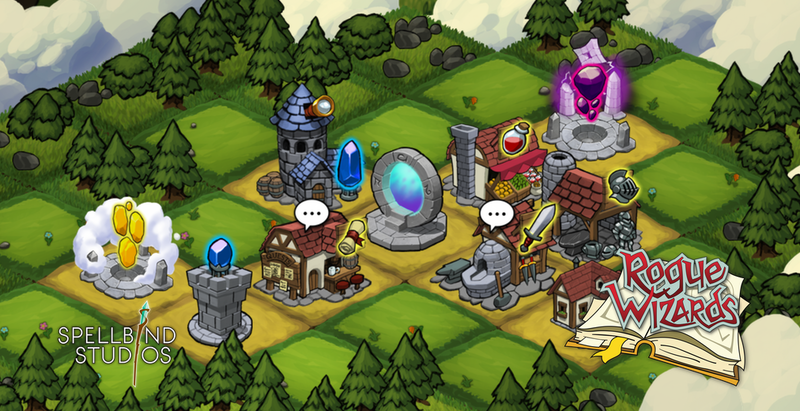 We’ve also now got the story and quest structure going into the game in stages. The storyline will take the player though an as of yet undetermined number of randomized dungeons, but we have mapped out 5 dungeons in which you’ll find NPCs to take back to town as well as 6 elemental dungeons the player will encounter each with NPCs and a boss battle. 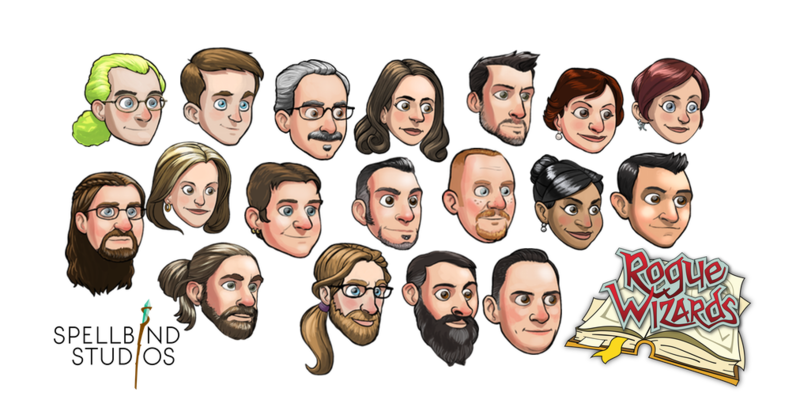 Alex has completed the artwork for all 18 NPC heads that are based on the Kickstarter backers that wanted to be in the game. These NPC heads are being animated as we speak so that they can perform all the same actions as the player character. You’ll find many of them in the dungeons where they’ll fight along side of you for a while until you lead them back to the safety of the town, where you’ll be able to build a permanent dwelling for them. 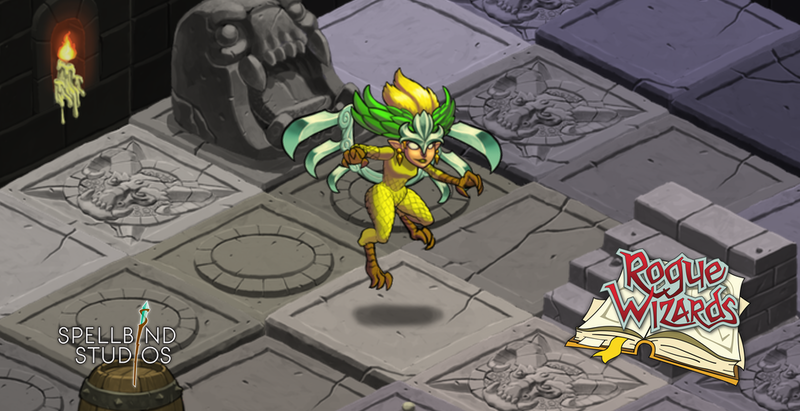 Finally, here’s a look at the Harpy enemy who is now fully animated in the game. Here’s the development highlights and details from the past month. Want to talk about these changes or other aspects of the game, then visit us in the online forums. – Removed TownDialogProtoype and moved the specialied fields into DialogPrototype, it was not convenient to have a subclass cause it needs an inspector and you can’t use the auto prefab sets etc … and it’s just not that much waste memory wise at the end of the day. – Re-organized the contents of the “Story” folder to better allow for Main, Side, and Template quests. – Backup scripts now force create necessary directory trees when they don’t exist … fixes a super critical bug that will wipe all files from the perforce account on the server, yikes! – Removed the generation of pass actions when trigger action generation failed, we now return null from all cases, and when self generating actions such a return result will be automatically turned into a pass action at one spot in the code instead of many. – The DialogUI is now capable of automatically splitting text that is “too long”. Splits occur at sentence breaks if possible, and other word punctuation breaks if not. August 27, 2015 in Rogue Wizards.